One thing this shtfmom has given great thought to is how to cook if things go south. Back plans to back up plans…Of course I have your typical electric oven (which I wish was propane, but so it goes). But having gone through a few different times without electricity for long periods of time I have had to address the issue of how to cook without electricity. Yes, there is the rocket stove and you can make those on the cheap…but having a natural abundance of free wood spending that money on a good one (after all I have quite a few people to feed!) and a fire pit and cast iron…well, of course this is appealing to me…not to mention sitting around a good fire and eating great food with great company. There is nothing like an open fire to bring people together. And I don’t about you, but in a situation where you have chickens, alot of the time people avoid the ‘wings’. This is a GREAT way to use the wing and eat well. In any type of situation you may come across in this world, knowing how to cook over an open pit fire will serve well…give it a go and give it a try! Being prepared to cook under various conditions and using different methods is a plus in my book! Hope you enjoy the video and the inspiration it may give you and maybe next time you decide to ‘grill’ you may think about open pit cooking instead. And by the way…find him on YouTube for more great survival skills…great and informative videos. Making wings in a dutch oven. They turned out great. coat wings in olive oil, dredge wings in remaining ingredients. Cook at 425 in preheated oven for 30 minutes on a cookie sheet. You can flip them at 15-20 minutes. I usually don’t. If you like crispier wings, just cook longer. At time of plating you can ad shredded parmesan cheese or the regular granulated works fine. Or just eat as is. That’s what I go by for fixing in the oven. A dutch oven takes longer and won’t crisp like an oven but they are fall off the bone good. Expect an hour minimum cook time. The longer they cook in a dutch oven the more tender they will be. 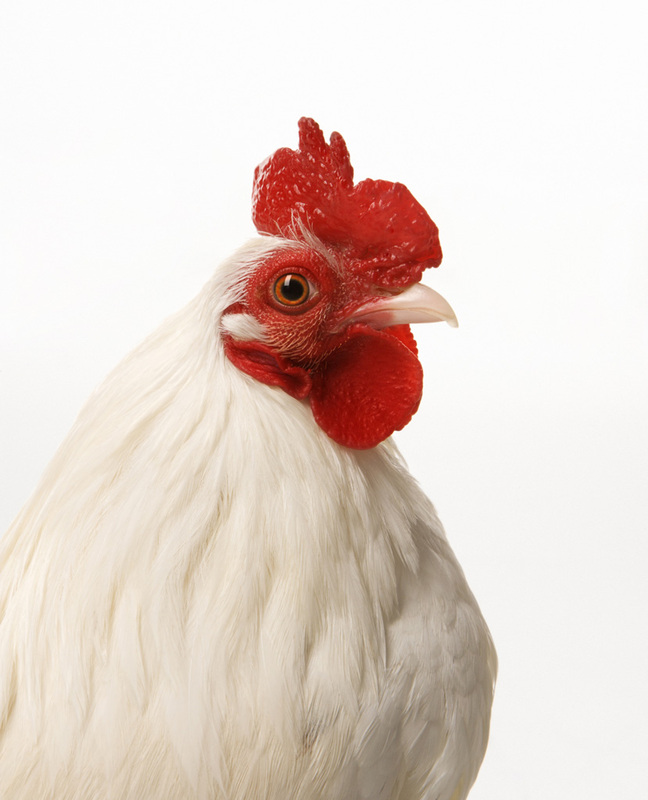 If concerned about eating under cooked chicken of any kind, the rule is 160 degrees. If chicken exceeds 160, your good. 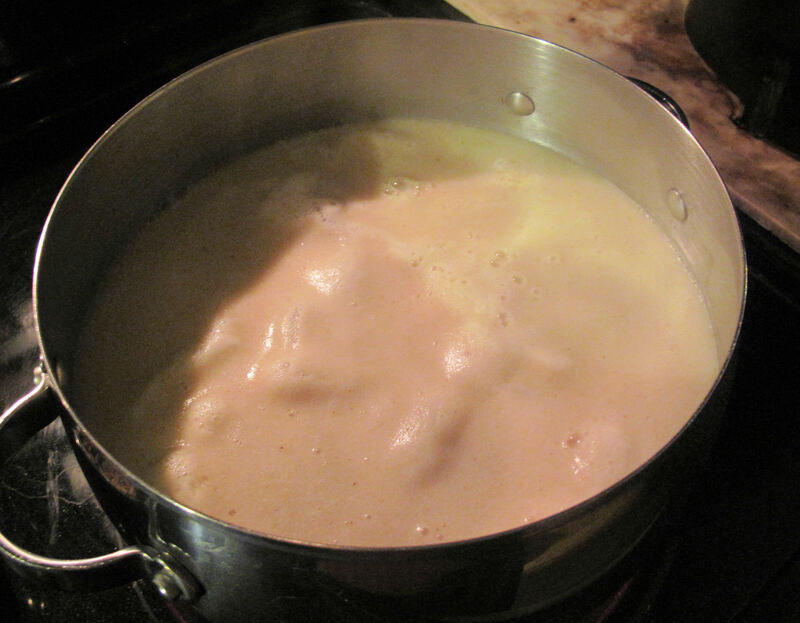 There is actually enough moisture in the pot to cook for an hour and a half to 2 hours. As stated, longer cook time for a dutch oven, the more fall off the bone tender. Protein is an invaluable source of long term energy in a survival situation or in any situation in which we are called upon to exert more energy than usual (camping, running, etc.) and/or a time when you can’t really cook or want to keep it simple during and emergency…prepackaged dehydrated food is great if you can find it cheaply, but knowing how to properly dehydrate protein NOW, yourself, before something happens is something to learn how to do and after the initial expense of buying a good dehydrator you will wind up saving yourself tons of money, not mention YOU get to control what goes in your food. Previously I had dehydrated chicken breasts using one of those smaller, cheaper food dehydrators and honestly, after rehydrating and trying to eat it on the go, I thought that perhaps there could be a better, more flavorful way of doing this. I wound up buying last year an excellent Excalibur Food dehydrator at a good discount from ebay simply because I was becoming frustrated with the limited amount drying space I had with my old round one. It wasn’t very efficient at drying, the middle ring took forever to dry, with the bottom and top ones drying very quickly and uneven drying on all rings so I was constantly moving the food I was drying around and the large slots meant a lot of food fell through as it was drying…nope…I bit the bullet and bought a good, solid Excalibur and I highly recommend that if you are serious about drying foods for storage or use during camping that you get one…well worth the money! 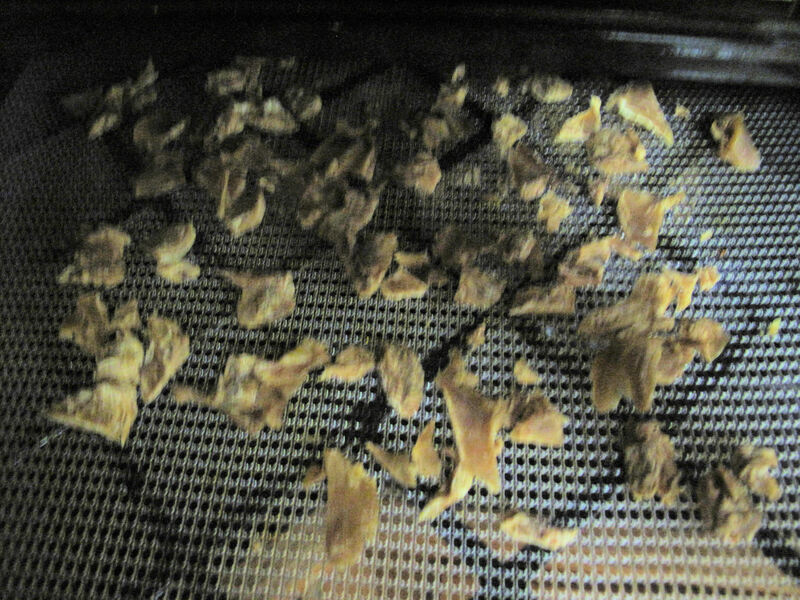 So here we go again on how to dehydrate chicken, while the first article I wrote on dehydrating chicken is a great and simple start to doing so, I have tweaked my technique and have learned a few tips to add to dehydrating your chicken to make your chicken turn out so much more better. One thing I have learned since last writing about dehydrating chicken is that DARK MEAT is the best when dehydrating chicken. When you go to rehydrate or eat it like jerky, it rehydrates much more readily which can be important if you are carrying it with you to eat on the run. I also like to use thigh or leg meat verses the breast…again, just easier to rehydrate. 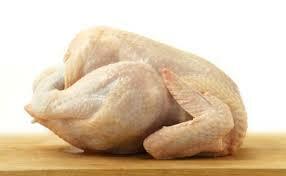 But use what you have, white meat, thigh, breast, leg, whatever, the process drying is the same. My only note on chicken breast is that it rehydrates more slowly and is tougher after rehydrating (not to mention it COSTS more money unless you can get a real deal on it). And don’t forget you can use bone in or bone out. 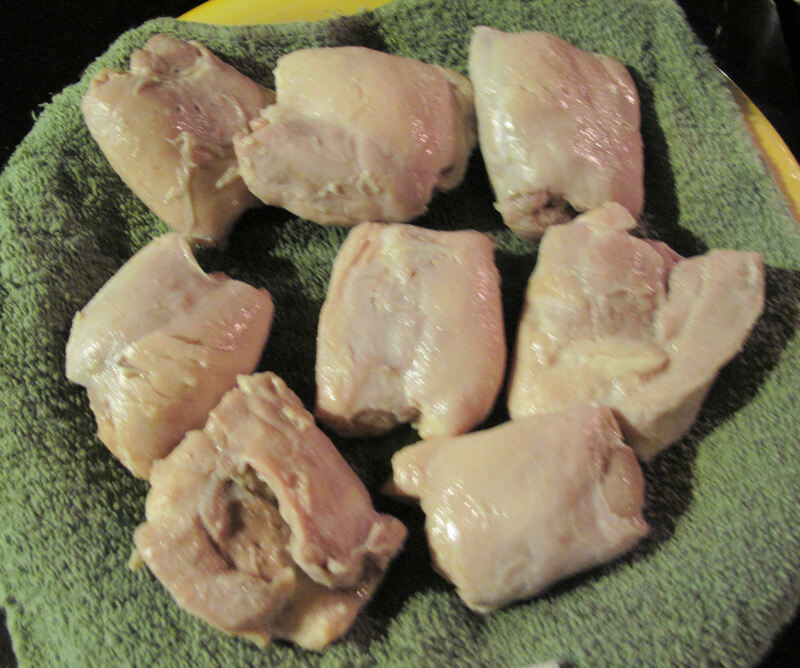 So, I found on clearance boneless chicken thighs (mostly dark meat) at the local market…spent maybe $2 for the package. If you are using chicken with bones in it, you will just need to spend the time taking the meat off the bone before putting in the dehydrator. In one large pot I put 12 cups of water, seasonings to taste (I like to use garlic and onion powder with a touch of salt) and put about 1/3 of cup of each into the water. Then in goes the chicken. At this point I bring the water, seasonings and chicken to a roiling boil and allow it boil itself until done. You will have to gauge for yourself when it is done cooking as boiling/cooking time will depend upon what you are using. 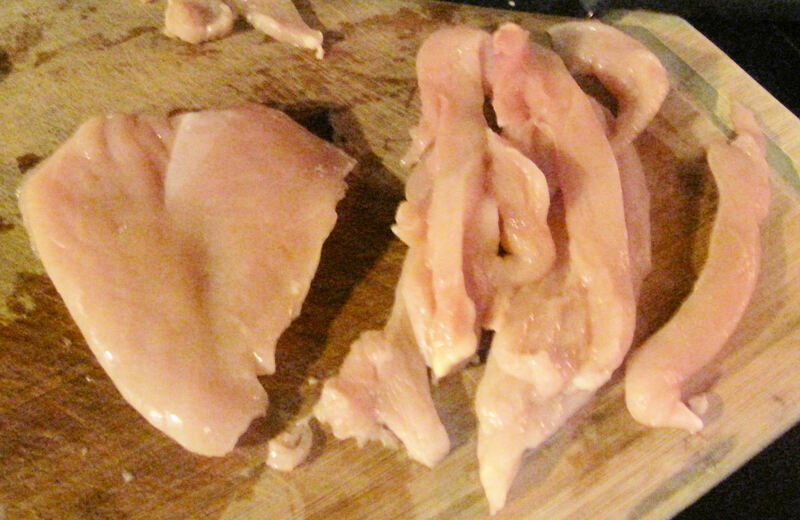 To speed up the process of cooking and if you are using chicken breasts, I have found that by cutting up the breast into chunks FIRST (raw) and then cooking saves time and you don’t over cook the thinner chicken. When the chicken is done cooking you will then need to do one of two things at this point…if you are using chicken that has a bone in it, you will need to get the meat of the bone place the meat on a plate covered with a couple layers of towels. 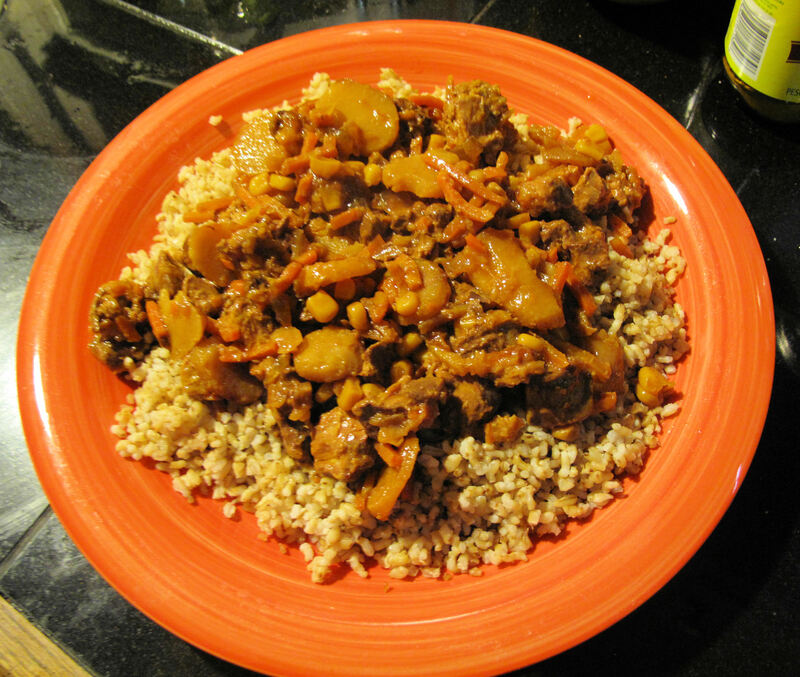 If you are using boneless meat you may just place the meat on a plate covered with a couple layers of towels. FYI: That water you just added spices to and boiled your chicken in? 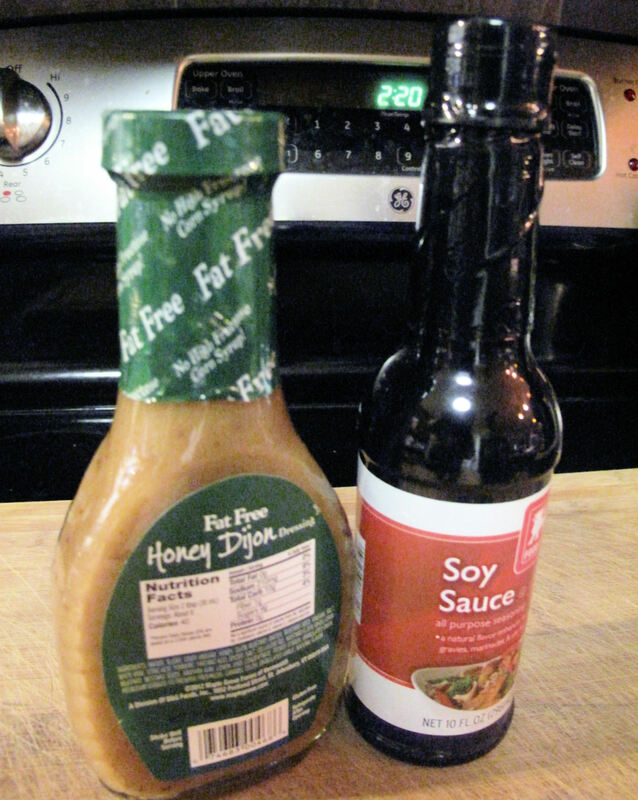 Excellent stock/soup base…don’t throw it away! Extend your money! Can it, freeze it, etc. IF you find yourself without power you have ‘instant’ soup base to rehydrate your chicken in! 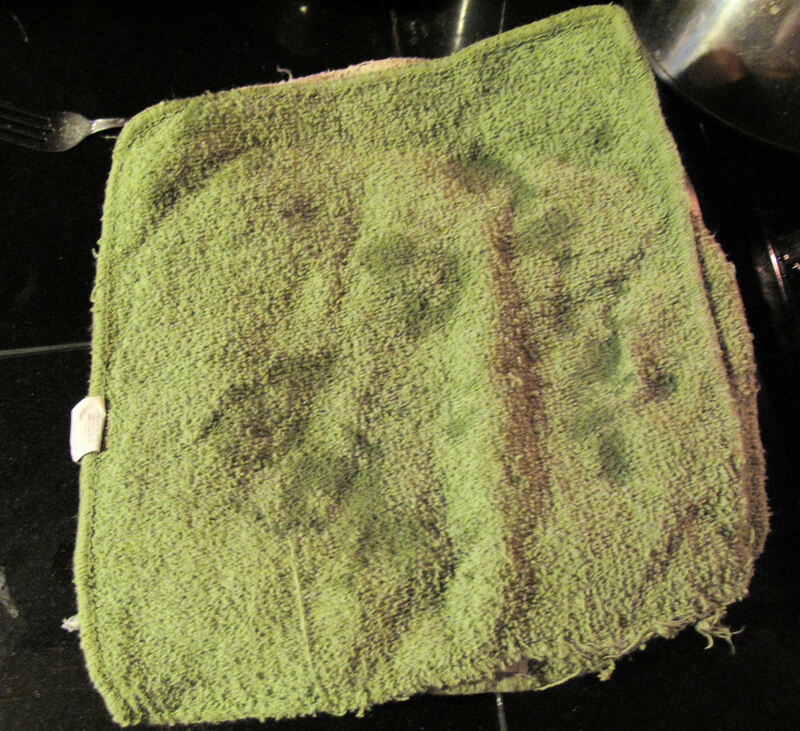 Next, you will want to take two more towels, lay them over your meat and press the ‘juice’ out of the meat…this helps to speed up the drying time and keeps the meat from becoming too tough from ‘over dehydrating’ which can easily be done since everything you dehydrate is from the outside in and meat likes to retain its moisture! It wouldn’t to ‘burn’ (over cook so to speak) your meat! Then allow to cool to room temperature, to speed this up you may place in the refrigerator. I am not sure WHY this helps, but by accident and then by design I have found that this really helps with retaining texture, taste and helps prevent the meat from being tough after rehydration (even with chicken breasts). 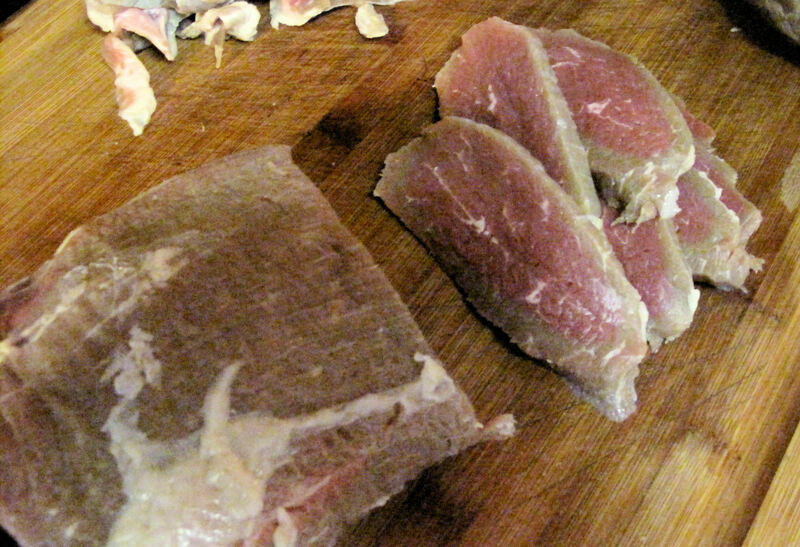 After your chicken meat cools off you will need to pull or cut into bite size pieces or whatever size you want. 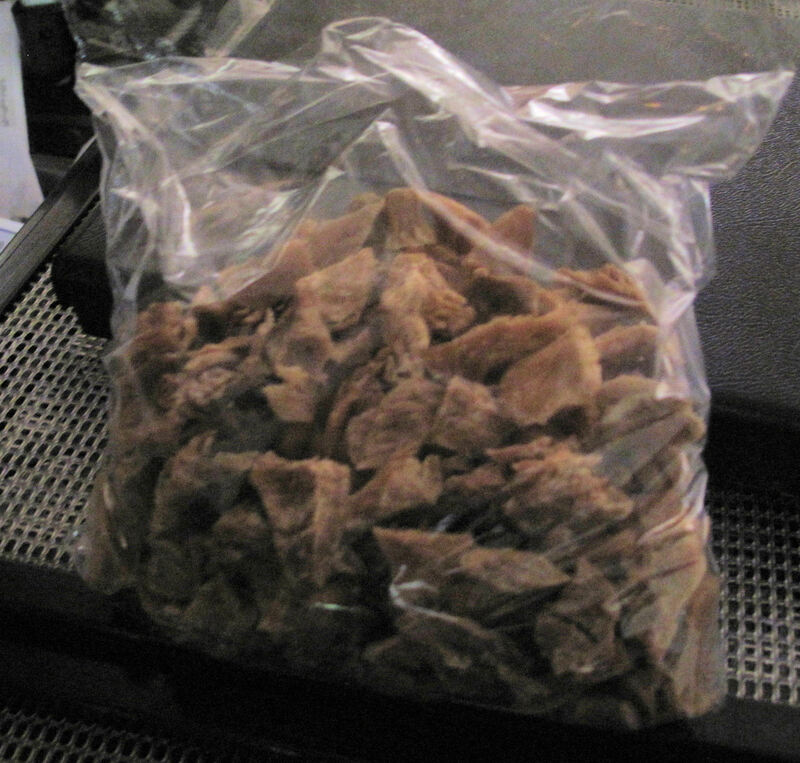 I just like bite size because its faster to dry and easier to rehydrate in your mouth if you want to eat it like that and if using in soups or casseroles you require less water/time to rehydrate (which is important especially if using with noodles or dehydrated veggies which rehydrate faster). Very lightly spray your trays with an oil (not a lot, just a very, very light coat). This will prevent sticking which is very important if you are using one of the dehydrators that cheaper ones with the big slots. Not so important with an Excalibur as the screen is flexible, but I still spray, makes clean up easier! At this point, close up your dehydrator…if you have one that allows you to set a temperature on it, you will use 155 degrees temperature setting, if not, just turn it on. Leave the dehydrator be for at least 3 hours before opening and checking on the chicken. After 3 hours I found mine almost done. You may or may not have the same experience. But if not almost done at this point (and there are many factors that control this) close back up and check again in a couple of hours. For those with the smaller, cheap dehydrators you may find yourself having to move trays and chicken around to get more even drying. If I am dehydrating A LOT of meat in my Excalibur I wind up moving the racks around once, the top one and bottom one go into the middle and the middle racks go on the top/bottom. But with only 2 racks in I did not have to do this. IF almost done, shut it down and allow to cool again. I left mine overnight. 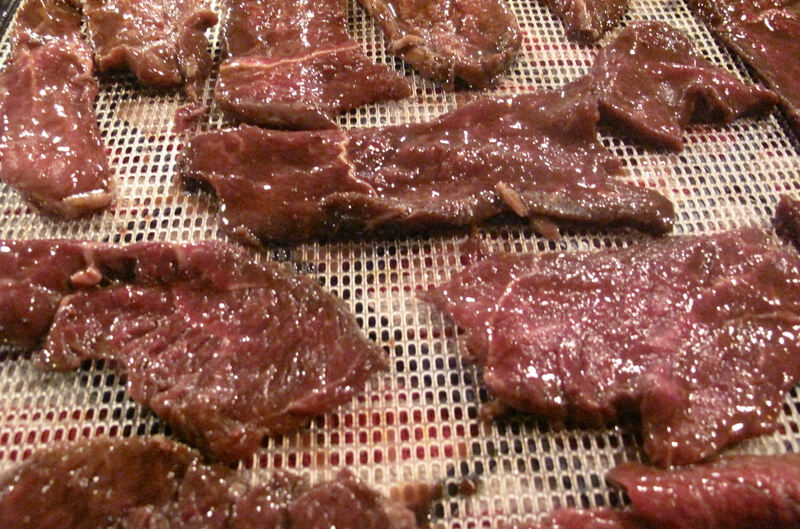 The point being is that you will want to shut the dehydrator off when the meat is almost completely dry and allow to cool off. 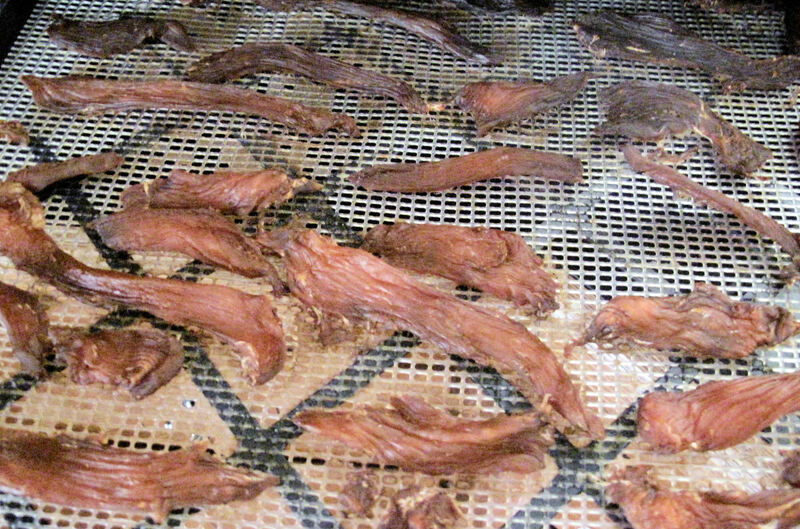 After cooling off, restart your dehydrator to finish dehydrating. Be careful at this point to check about every half hour so you do not over dehydrate and potentially burn your chicken. You will know its completely dehydrated when it is no ‘spongy’. I like to ‘sample’ a piece. It will be ‘dry’ and crunchy but easy to chew. Don’t worry if it’s ‘hard’ that happens, but the more you dehydrate meat the better you will get at gauging when its ‘perfect’. Allow to cool again before packaging by the method you want to do so. 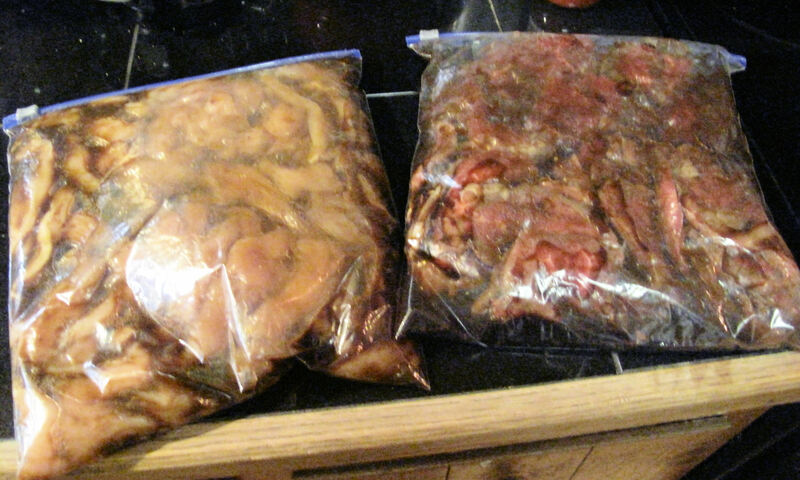 If you will be using within the week, ziplock baggies are great…anything longer than a week and you will want to vacuum seal the chicken some how, in a jar or a food saver, though the old timers never did this! For long term storage you will want to remove all the oxygen for best results and longest shelf life. Will store this way for AT LEAST a year, depending upon storage conditions. Dehydrated properly, chicken (or any meat) is a great way to save money on food storage, make ‘fast food’ meals with little to no mess (one pot! Ever tried cooking after a hurricane? The less ‘pots’ the better!) or it’s a cheap way to make your own camping/bug out food. About 4 cups of protein and weighs in at just over 2 ounces. Pretty simple, you can either just munch on it using your own spit to rehydrate it or you can add to water, soups, and so much more! Put together with veggies and noodles in water for a fast meal. Takes about 15 minutes in boiling water to completely rehydrate and heat depending upon the size you make the ‘bites’. Feeling chatty today 🙂 been thinking about food storage alot lately, most especially after my latest trip to the grocery store. Found chicken breast on sale for half-price for the holiday weekend earlier this week so I bought every bit I could with the money I could spend. This was a good thing, but I wound up with over 20 pounds of the stuff and with no more room in either freezer but I had a brilliant idea (yeah, you know the kind, the kind that gets you in so deep that you can only go forward). Dehydrate it! Now, mind you, the dehydrator I have isn’t a fancy one (no temperature control or timer) and I haven’t used it in years…let alone ever used it to dehydrate chicken, but what the heck, I have been reading all over the place about dehydrating meat (and doing it myself is surely cheaper than buying it canned or freeze dried!) and thought perhaps I could do it myself..oh boy…dehydrating 20 lbs of chicken turned into a 4 day odessey of cooking, pressing, cooling, chopping and then watching the bits and pieces of chicken shrink up into tiny pieces over the course of a few hours. My family was looking at me like I was growing heads or had spots all over my face asking such questions like: What are you doing with all that chicken? (I could just hear the groans inside their heads as they saw visions of eatting chicken for the rest of their life) What’s in the pot? Um mom, why are you pressing that chicken in between towels? Then the final questions: are you done yet? what are you going to do with THAT? (referring to the shriveled up, corn kernal looking things that now sit in 3 quart sized mason jars). 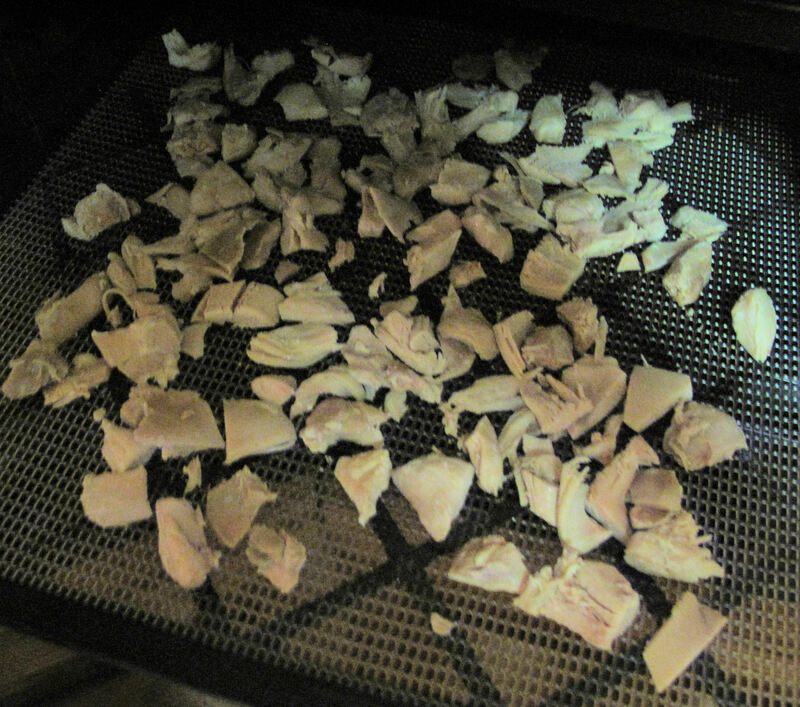 Anyway, I digress from my purpose of telling you about dehydrating chicken…it actually turned out to be super easy to do (next on my list is eggs, maybe this weekend, after doing strawberries). I first embolden myself and reaquainted myself with the process of dehydrating by dehydrating quite a bit of zucchini that my next door neighbor gave me and then tried rehydrating a few pieces just see that it would do so (never mind theory okay? I have to sometimes see it to believe it, just me). And first thing is this…I noticed this SMELL coming from the dehydrator…you know, that smell you smell when you turn on the hair dryer or space heater that you haven’t used in a LONG LONG TIME? yeah, that smell…and then I realized that I would have to play switch the trays around to keep it all drying at about the same rate, and then noticed that the food was sticking to the tray, and I forgot to make sure I had clean mason jars before it got done…you get the idea…but it worked out…growing pains I suppose you could say…next, I did some research trying to find WRITTEN instructions on how to dehydrate chicken online to no avail…sigh…YouTube had some videos on it, but they were long and boring…just TELL ME and let me get on with it okay? but I hung in there, thinking that maybe, just maybe there was some sort of ‘secret’ to dehydrating chicken that I just needed to know…nope…just the basics…keep it clean, cook it well, dry it well and then store it well…and try not to eat it at the sametime you are working with it (have to test the product don’t you?). Below are the written steps to dehydrating chicken breasts that I was searching for (and if my internet search querry is correct…so are a million others)…I use chicken breasts, not bone-in chicken and that is what the directions are for…I suppose you could use bone-in chicken if you feel like taking the meat off the bones after cooking, but I haven’t done it that way myself…adapt if you must. and one note: if you don’t want to get sick make sure you wash your hands well everytime before and after handling the chicken…don’t handle the chicken and then touch a spoon or pot or jar or anything like that…safe food handling practices are a must! Chicken, pot, water, seasoning, mason jar(s), oxygen absorbers, dehydrator, knife, towels, baggie, refrigerator. 1. Remove all the fat (if there is any) and skin from the chicken. Fats do not dehydrate nor store long-term very well. 2.Cook your chicken and cook it well…your choice on how you do this, but the idea is that you cook it well until its DONE…err on the side of caution and over cook it if you must. Personally I prefer to just boil it, that way I can add seasoning of my choice while its cooking and it gets in there really well…bonus to this way of cooking it is that you get a really nice broth that can be frozen for future use as a soup base or for replacing water in a receipe if you want more flavor. 3. Let the chicken and broth cool off completely. 4. Get towels (I use bath towels that have been re-purposed for kitchen use) and lay them out on the counter or table top double thickness at least. 5. Put the cooked chicken on the towels. Place another towel over the chicken and then press the HECK out of the chicken. Object being when doing this is to get excess juice out. Shorter drying time. 6. Personally I prefer at this point to stick the chicken into a zip lock baggie and refrigerate over night…makes it easier to cut it up into small pieces…warm chicken is hard to cut up easily. 7. The following day get your dehydrator out. Now, first time I dehydrated I didn’t have the mesh screens to go over the tray. Second time around I did. It will work either way, it is just a bit messier if you don’t have the screens for the trays. 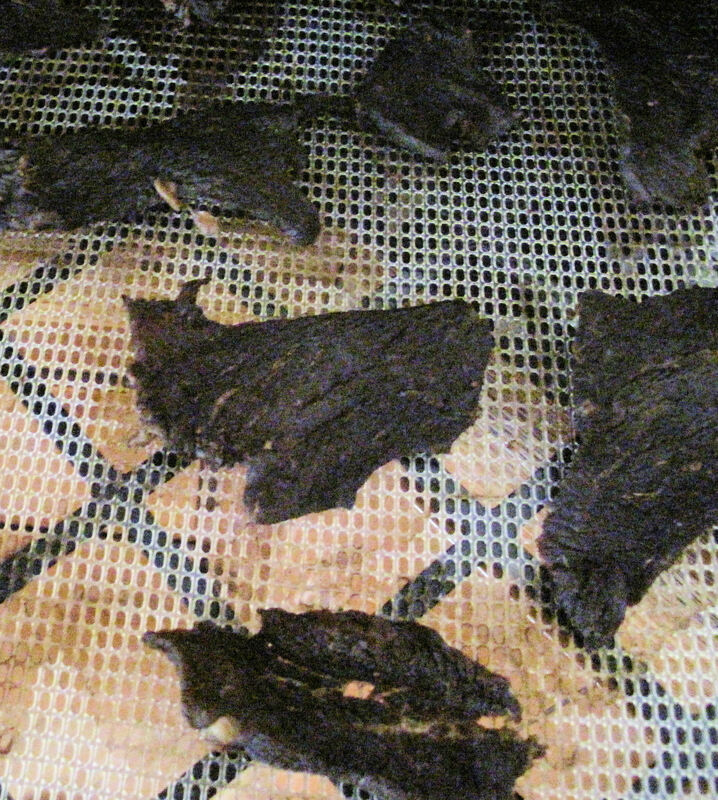 Make sure the dehydrator is clean and ready to use. 8. Cut the chicken up into small pieces. I tried a bit of experimenting at this point with different trays, big pieces, small pieces, tiny pieces…the tiny pieces got so small they fell through the cracks, small pieces and big pieces did okay, but use your judgement as to how big of pieces you chop it up into. This will depend upon your drier size since the racks (at least on mine) sit one on top of the other I found the best size for me were pieces about 1 inch long or so no thicker than 1/4 inch. Just chop it! 9. 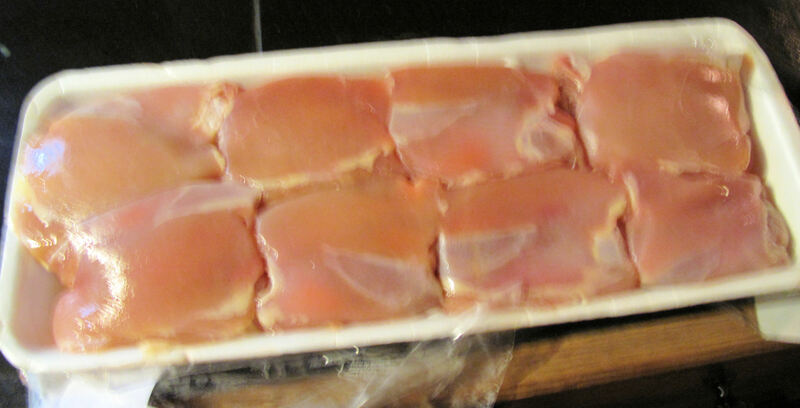 Spread the chopped up chicken around the tray evenly in one layer. Do this for each rack. I found I was able to get about 9 pounds or so onto 5 trays (that is my drier, its one of those round ones with plastic trays that stack up). But I had extra chicken that I just put back into the refrigerator to do later on. 10) Stack it up and turn it on! Now, with my dehydrator I have no temperture control so for me its just turning it on and watching it. If you have a dehydrator with temp control, it is my understanding that you want the temp set at at least 120 degrees for meat, but somehow I don’t think mine got that hot. 11) Walk away and let it go. For me, I had to switch trays around (bottom tray going to the top) every couple of hours to keep things dehydrating somewhat evenly. 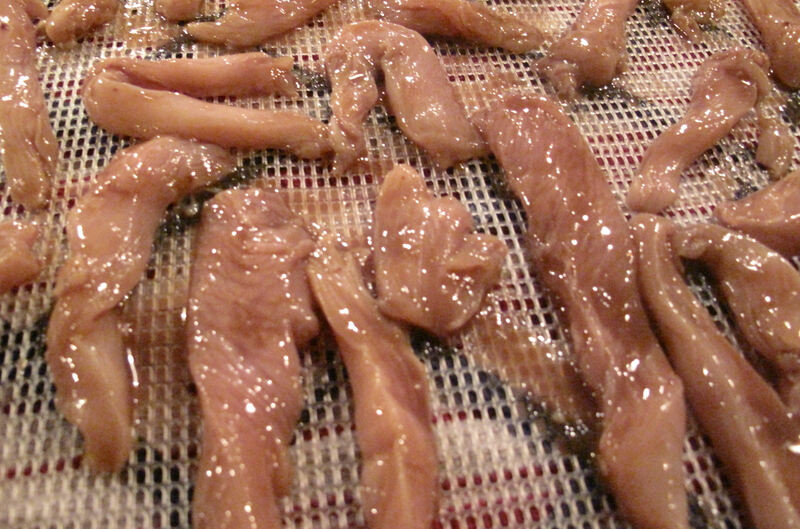 It took about 10 hours to completely dehydrate the chicken. You want it CRUNCHY and ‘brown’ looking with no softness to it whatsoever. That is moisture and that is NOT good when storing long-term. 13) When it is ‘done’ turn off the dehydrator and let the chicken cool off again. Heat will cause condensation which you don’t want in the jar. 14) Once completely cool, you can now fill up the mason jar…fill the jar until you have about 1 inch from the top. Now place one 200-300 cc O2 absorber on top and tightly screw the lid/top on. Set the jar aside and check to make sure that it has made a seal about an hour later…you check this by pushing on the top…as long as it doesn’t move you are good to go, if it does move, your O2 absorber was probably bad and you need a new one. Repeat. All done! Now you have your dehydrated chicken that will store for several years and can be used in soups, stir frys and such.